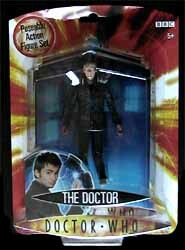 Doctor Who fans are really getting spoiled now with the latest batch of action figure releases from Character Options. The frankly abysmal Dapol figures from the late 80's and 90's are now thankfully just a distant memory (K-9 in green? Tom Baker without a scarf? A choice of two (??!!) Bonnie Langfords in different coloured tops? No, that must all have been a dream, surely?) as we are treated to the latest new release, the tenth Doctor himself. 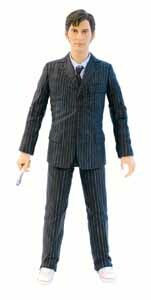 Although you can choose to buy a version of David Tennant's Doctor with a long flowing brown trenchcoat, the figure under review here simply wears the trademark pinstripe suit, and very dapper it looks too. As we have come to expect from Character Options, the detail on this figure is incredible, and instantly recognisable as the tenth Doctor. It also has several points of articulation - in fact, his legs are much more flexible than I first imagined, the tenth Doctor could probably ride two horses at once. Although supposedly marketed at children, make no mistake, it's the grown-ups that are snapping up these terrific figures left, right and centre and they are already proving pretty difficult to track down in the shops as the shelves just can't be stacked quickly enough. If you see one - buy it.